See below for Lift Safe Direct's large range of drum trucks, drum trolleys and drum dollies. We manufacture all drum handling equipment at our UK plant to the highest specifications and all our products have a durable polymer powder coated finish. We also offer an in-house design service. So if you cannot see a product to meet your requirements please contact us to discuss your requirements. Universal drum truck. Suitable for steel, plastic or fibre drums. Ideal in any industry using drums. A robust designed drum trolley with fully welded construction to carry a single 610mm Dia steel drum. A basic style drum stillage used to lift a 210 litre drum into the working position. Comes complete with handle. This drum stillage is similar in design to the DH05-DS07 with the addition of wheels to assist in moving the drum to it's working position. Comes complete with handle. 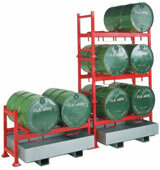 This drum stillage has the attributes of both the DH06-DS07 and the DH07-DS08 which allows for ease of operator use. This 4 x wheel ergonomic drum is designed to hold a 210 litre (610 mm diameter) drum and will fit through a standard door. Red epoxy. A medium duty drum dolly, Max drum dia: 610mm. A medium duty drum dolley designed to hold 210 litre steel drums. Height: 150mm Width: 745mm. This flexible modular system of storing drums is perfect for a wide range of applications. The strong welded steel construction means that each section can be stacked up to 3 high. 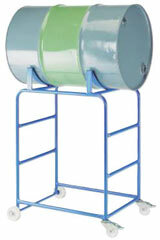 All welded flat and tube steel high drum stand, available in a mobile version or static version. 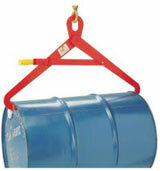 Can carry up to 250kg drum and comes in a blue epoxy finish. ully enclosed drum storage with integral sump. Fixed sump, back and 2 sides, hinged roof and twin hinged doors with lock. Drum trolley with integral sump. Sump trolley for 2 vertical or 1 horizontal drum when used with drum rotation frame. Sump capacity is 250 litres. Removable galvanised steel support grid and drain plug. Designed to store drums either vertically or horizontally for ease of use and access, In case of leakage. For lifting 210 litre tight head steel drums, using overhead lifting gear or fork lift adapter beam. Designed for transporting of 210 litre tight head drums. Spring loaded hardened steel jaws grip the chimb or rim of the drum.